The emergence of Enterprise Software over the past ten years has revolutionized not just how computers are used but the very way companies think. In the past, a typical company would design its own software for individual operations or would purchase “off the shelf” software for specific tasks. This led to a complex mix of non-matching systems that rarely communicated well and led to extensive maintenance of systems. Companies had large IS (information systems) or IT (information technology) organizations that wrote software, provided the linkages to purchased systems, and maintained the system. Because these software experts were often located inside individual business units, it sometimes happened that different units could not communicate with each other except through written reports. The development of the Enterprise Software systems offered the clear advantage of connecting every transaction in the company to a central database that could be accessed by the appropriate corporate systems. Unloading a truckload of chemicals in any part of the company became a corporate piece of data, not just an isolated act to be observed only locally. This also means that the company financial books can be adjusted for the cost of this transaction immediately. There is no delay for passing data from point to point or clerk to clerk. This is good stuff; it offers enormous benefits. What has happened here is that companies are moving from a wide variety of relatively simple systems but with complex interfaces, to a single complex system with simple interfaces. This clear choice offers major benefits to the corporation but is seen as painful by each unit of the company. For most, this is the proper trade-off. However, the choice does have a major impact. The company wants to improve its business processes by implementing ERP. The company plans to install an Enterprise Software (ES) simultaneously with implementing ERP. The company has no ES and presently has no plans to install one. It wants to implement ERP, perhaps using a legacy system or possibly by acquiring low-cost software to support the core ERP functions of demand management, master scheduling, Material Requirements Planning, and so on. Next let’s talk a bit more about these categories (advantages and disadvantages which I would rather say “ the challenge” of each category). The typical company in this category has, with substantial pain and expense, installed an Enterprise System (ES) and not gotten much back in return for its efforts. The ES enabled it to become Y2K compliant and it can close the books better, faster and cheaper than before—but that may be about it in terms of benefits. Many companies think they are ES capable simply because they survived Y2K. Of course, they may have only installed some of the ES modules and may be limping along with mediocre results. The people are a bit bummed and a bit burned out; they spent endless hours sitting in meetings and in training sessions but they find that things haven’t gotten any easier. First, the software selection step can pretty much be dropped. The bulk of the software has already been selected, with the possible exception of one or several bolt-on. Second, the software installation and enhancement step on the Proven Path should be straightforward. Most of the work here will involve nothing more than re-setting some of the switches in the ES, to enable the core ERP functions to operate correctly. During this step, it’s important to involve people with a good knowledge of the ES in order to help identify and facilitate this process of “tweaking” the system. A caveat: This requires real expertise and great care. Remember that the linkages in ES are so extensive that even a minor change involving a few switches can have far-reaching effects. One last point: Companies that have already installed an ES are strong candidates for a Quick-Slice ERP implementation. Before you attempt a combined ERP/ES implementation, evaluate your resources very carefully. Make certain that you are one of the few companies that have enough resources and organizational bandwidth to get the job done successfully. If you conclude otherwise, then your best route is probably to implement ERP first and then Enterprise Software. Let’s be clear on the ERP/ES implementation concept. It is clearly the most efficient way to handle these two major changes. However, very few companies can provide the resources to pull it off. The resource drain is huge and hiring armies of outsiders to help is not the answer. Most who have tried to do both have stopped in mid-project and done one or the other. Typically, the nature of the ES installation requires that the company finish ES and then get back to ERP later. Danger lurks among the rewards! Threatening? You bet. On my next post we will deal with the costs and benefits of the total ERP/ES implementation more completely, but for now, remember that the choice and installation of the software requires the same careful planning as any other project that costs millions of dollars and involves almost every person in the company. In the first case, “having it” usually means that it has an older, pre-ES set of software for MRP II. Perhaps the company took an earlier stab at implementing the resource planning processes—master scheduling, MRP, Plant and Supplier Scheduling, etc.—but didn’t succeed. Or possibly it never attempted to do so. In either case, it has software. Now the people might not like it; they might be saying things like, “Our software stinks.” But the odds are quite high that it’ll be good enough to enable the basic ERP processes to work. The moral of this story: use what you have if it’s workable. An excellent resource here is the MRP II Standard System, which details the features and functions that software must contain to support effective resource planning processes. The second case states that the company doesn’t have software to support ERP. Perhaps its legacy systems are home grown, and they contain logic that simply won’t work in an ERP environment. In this case, we recommend you buy one of the many low-cost PC-based ERP/MRP II packages that are available today. You can probably get everything you need for less than $100,000. And most of it is quite good—fairly complete functionally and very user friendly. Since the price is relatively low, you can buy it and use it for a year or so, and then if need be, replace it with a full-blown set of ES software if you wish to head in that direction. 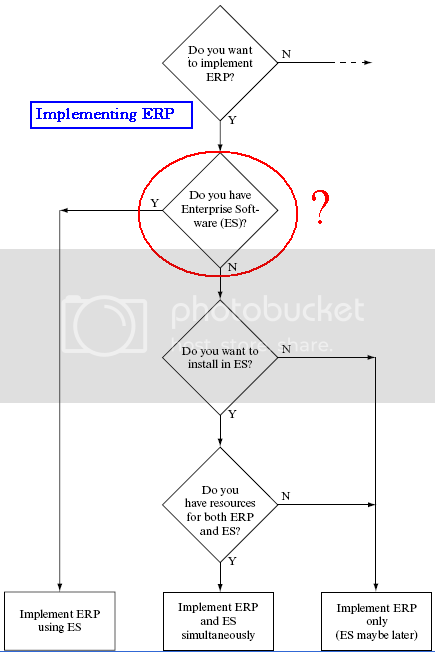 Please keep in mind that this ERP/MRP II software is not an ES; it won’t be truly stand-alone software; and it will in effect be “bolted-on” to your existing software.